It still in early beta stage but usable, please enjoy it! Last edited by Kuan Hsu on Apr 23, 2019 14:27, edited 507 times in total. Why do you use a monospaced font for the left (treeview) pane? IMHO that wastes space and doesn't add much. Were there some good points to the IDE? It's from a First Post of a new member and I have not attempted it (yet). I'm not lazy (more like cautious). An editor is a highly complex program and this is the first post of a new member. What is the editor you use for FreeBasic and how does this one compare? I am also waiting for comment from intrepid testers! It was just a first impression from the screenshot. It was what directly me struck me as strange. I don't really use FB, I follow it this forum for compiler and RTS related issues. When I use it I make small stub programs in joe and simply compile them on the cmdline. WinRar extracts this but not properly. Is there a free .7z extractor? By the way I've had a look at D in the past. It looks powerful but difficult. If I get your file extracted I shall certainly test it out. I tested it, and as you say it is still in beta. I had a few things that did not work as expected, but it shows promise! Keep up the good work. I can't want to see it grow. I tried it and it didn't use a monospaced font for the editor, probably because I don't have a font named "Inconsolata", which is set in the "Preference" dialog. When I try to change the font (press the "..." button) the executable crashes. I will add all font setting, I still can keep my aesthetic but everybody can set the font by themselves. About crash, I still have no idea what's happens, but I will rewrite the code and test it. I cannot get the ide to work with Win XP. 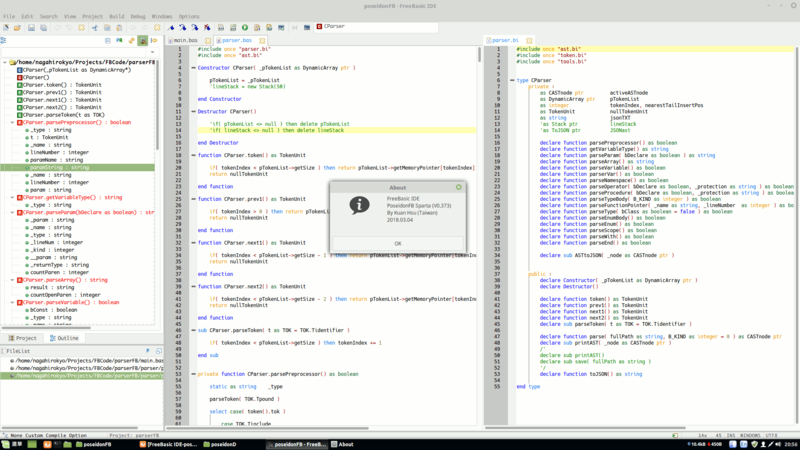 I get the ide running OK, but cannot compile. Also, I don't want to use the de-bugger, so how do I do that? I had to download an extra .dll file, maybe this is the reason. at the beginning of a source code. I have to get rid of it to run the file on fbide once more. Maybe it is just not XP compatible. XP is outdated now anyway. Kuan Hsu wrote: About crash, I still have no idea what's happens, but I will rewrite the code and test it. Unfortunately I haven't any experience with D and no D compilers installed. Looks very promising! 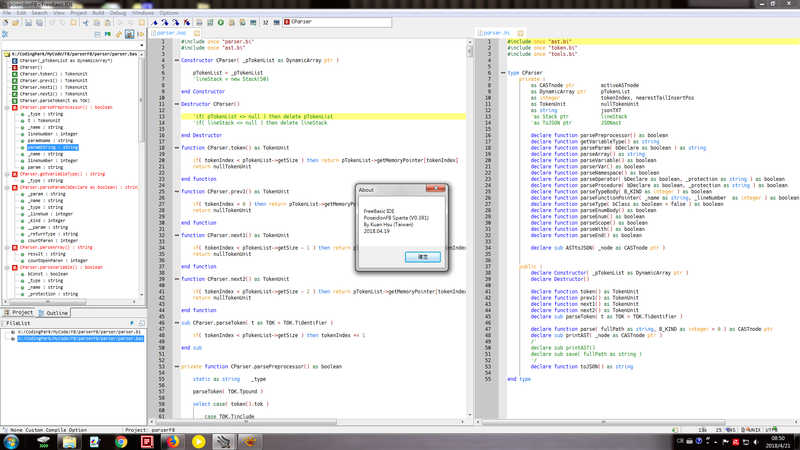 I have found a mistake: If you change the debugger path, it will be written into the compiler path. St_W wrote: Unfortunately I haven't any experience with D and no D compilers installed. The code had be re-written, please check it crash or not?